If graffiti is a major design movement, the contemporary equivalent to art deco, a total style from graphics to fashion to architecture. 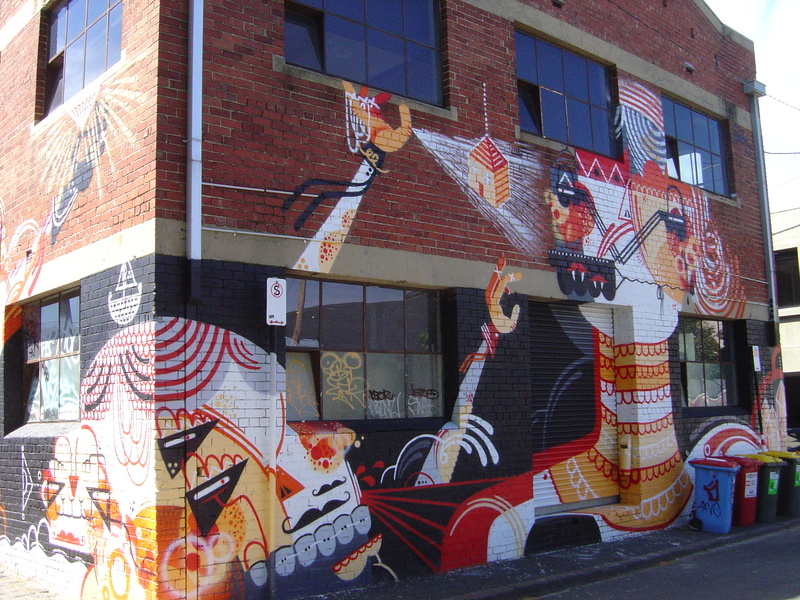 When I first wrote about street art and architecture in 2009 there was very little to write about apart from bigger walls. Now there are whole buildings. Painting whole wall or whole building is becoming more common in Melbourne with works by Reka, Ears, Ghostpatrol and others. Most pieces use a section of wall as simply a support for the paint without consideration about the size of piece in relationship to the size of the wall. Going around the corner, looking at the whole wall or painting a whole building is something else. But it is still just another façade. 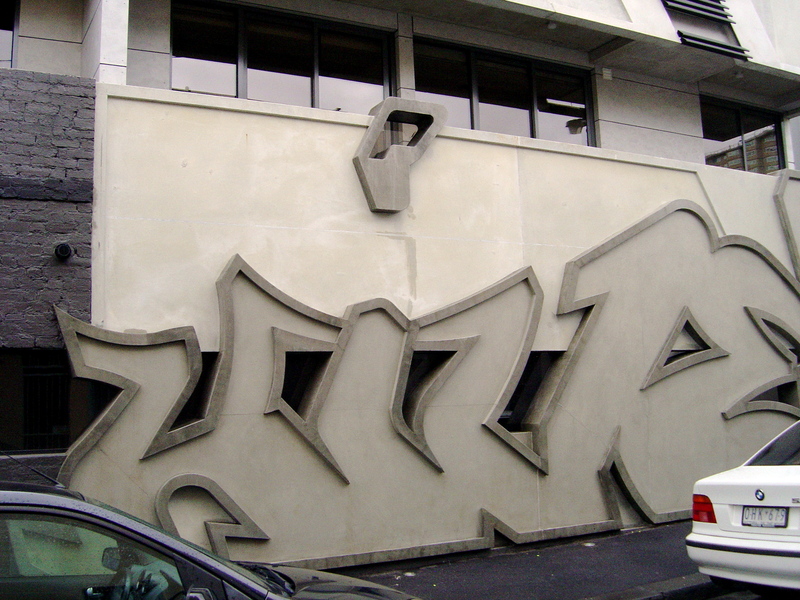 In 2011 ITN Architects built Hive Graffiti Apartments. Located in the inner city suburb of Carlton. The project is the architect’s home; I went along to see it when it was open to the public as part of Open House Melbourne 2012. 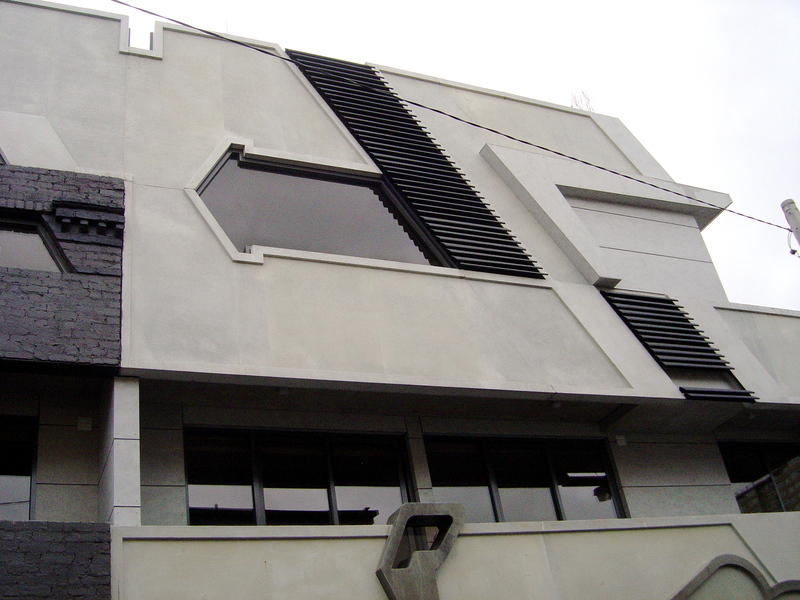 It is a joint development by the architect Zvi Belling and Melbourne old school graff artist ‘Prowla’, both of whom reside in the building. For more images and a floor plan of Hive see DeZeen Magazine. ‘Prowla’ was a member of the Rock Da City graffiti crew (1987 – 2009) – his dog was calmly watching all the people waiting in the garage from the stairs to his apartment. On one side of the building large concrete letters and windows spelled “Hive” along with a couple of arrows on the upper floor and some dynamic old school design. But what apart from the façade was graffiti about the apartments? It is hard to know as this may well be the first graffiti style building in the world. The Hive is the first in a promised series of Hip Hop buildings designed by ITN Architects maybe when we see some more it will be easier to say. Perhaps, it is the collaboration in the design, or, incorporating existing urban elements – from the original street face of the old tailor’s shop, the old brick walls and the laneway entrance. The house is like a fresh new piece in an old laneway. Inside the lines are crisp, it is compact and the angles flow with a cool direction. The street art collection hanging in the house was familiar – I’d seen some of it at a Melbourne Stencil Festival exhibition many years ago. The house was also familiar in a way, there was no feeling of being unable to imaging living there; it is like a typical flat only cooler. This entry was posted on Saturday, July 28th, 2012 at 3:18 PM	and tagged with architecture, Carlton, graffiti, Hive Graffiti Apartments, Open House Melbourne, Reka, Richmond and posted in Architecture, Street Art. You can follow any responses to this entry through the RSS 2.0 feed.